January 5 - Trial runs of the new Taiwan High Speed Rail service between Banciao (Taipei) and Zuoying (Kaohsiung), open to the public and with half-price fares, begin to operate 19 times daily in each direction starting..
WMATA Green Line derailment, January 7. 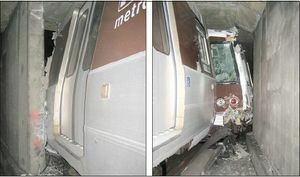 January 7 - A Washington Metro Green Line train derails (pictured) as it traverses a switch at about 18 mph; 23 of the approximately 80 passengers on the derailed car are treated for injuries at local hospitals. January 7 - The Swedish national rail company SJ AB reinstates daily traffic on the Kongsvingerbanen route connecting Lillestrøm and Kongsvinger in Norway and onwards to Charlottenberg in Sweden. January 8 - The Atlantic Coast Line, Cornwall, is reopened after recovery efforts to clear a landslide that occurred the previous December. Shepherds Bush railway station on the West London Line is scheduled to open. Announcement of rollout of the CityCargo cargo tram scheme in Amsterdam. December 4 - The United States Supreme Court issues a unanimous decision in a suit brought by CSX Transportation against the state of Georgia. CSX alleged that the method that Georgia used to assess the railroad's property value within the state was improper. Lower courts agreed with the state, citing the 1976 Railroad Revitalization and Regulatory Reform Act but the Supreme Court disagreed saying the act "prohibits States from discriminating against railroads by taxing railroad property more heavily than other commercial property in the State." Construction of Imperial Wharf railway station on the West London Line is expected to begin. For the new London Overground, Transport for London has ordered Class 378 (modified Class 376) units which will replace the British Rail Class 313 units and the East London Line A60 and A62 stock. The new units are expected to be delivered for the opening of the extended East London Line in 2010. December 24 - George Warrington, president of Amtrak 1998-2002, dies (b. 1952). ↑ Taiwan's high-speed rail system to start trial services next week. Retrieved on 2006-12-28. ↑ Railroad Accident Report: Derailment of Washington Metropolitan Area Transit Authority Train near the Mt. Vernon Square Station Washington, D.C., January 7, 2007. United States National Transportation Safety Board (2007-10-16). Retrieved on 2008-01-05. ↑ Shawl, Jeannie. "Supreme Court rules in sentencing, railroad property valuation cases", Jurist Legal News and Research, University of Pittsburgh School of Law, 2007-12-04. ↑ Associated Press. "Court Rules for Railroads in GA Case", 2007-12-04. Retrieved on 2007-12-04. ↑ Associated Press. "Former NJ Transit Director George Warrington dies at 55", NJ.com, 2007-12-24. Retrieved on 2007-12-27. This page was last edited on 24 January 2012, at 20:23.